The Boxing Truth®: A Look At Golovkin-Monroe Jr.
Undefeated unified WBA/IBO Middleweight world champion Gennady Golovkin has been gradually compiling one of the more impressive world championship reigns in the sport of Boxing. Golovkin, who became a world champion in 2010 has compiled thirteen successful title defenses in under five years and has along the way become a unified world champion. If Golovkin’s string of successful title defenses were not impressive enough, an element that has become a focal point of his reign as champion is his consecutive knockout streak. In addition to his thirteen successful title defenses, Golovkin has also knocked out his last nineteen opponents including such fighters as Gabriel Rosado, Matthew Macklin, Daniel Geale, Curtis Stevens, and Martin Murray. As Golovkin has continued on what this observer has called a path of destruction through the Middleweight division and has continued to score knockouts, a question that continues to be asked is who will be able to provide the champion with a significant test. In his last fight in February of this year, Golovkin scored an eleventh round knockout over a very “Game” Martin Murray. Although Murray was able to extend the champion into the eleventh round for the first time in his career, he was unable to discourage Golovkin and as the fight progressed the champion systematically administered a beating to Murray before the fight was stopped. As Golovkin has continued to successfully defend his title, a recurring statement this observer has said is I believe that it is time for Golovkin to face fighters who are considered top stars. An interesting storyline may be taking shape as former WBC Jr. Middleweight world champion Saul Alvarez expressed interest last week following his victory over James Kirkland of possibly moving up in weight to the 160lb. Middleweight division to face either current WBC champion Miguel Cotto or unified champion Golovkin. A fight between Golovkin against either Alvarez or Cotto would not only be extremely lucrative for all involved, but would also provide Golovkin with a marquee opponent. 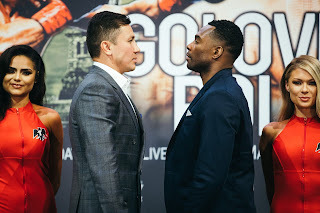 Before a possible encounter against either Alvarez or Cotto can be discussed however, Golovkin will make the fourteenth defense of his world title on Saturday, May 16th against number two rated WBA Middleweight contender Willie Monroe Jr. at The Forum in Inglewood, California. Monroe, a veteran of twenty professional fights will enter this fight on a nine fight winning streak. In his last fight in January of this year, Monroe scored a ten round unanimous decision over longtime contender Brian Vera. Monroe used his lateral movement, hand speed, and combination punching to outbox Vera en route to a convincing decision victory. It is logical to assume that Monroe, who has only six knockouts in his nineteen career victories will look to box Golovkin from the outset. Golovkin however, has shown in the past that he can apply consistent pressure even against fighters who are known for their Boxing ability and ability to throw punches in volume as he did against former two-time Middleweight world champion Daniel Geale in July of last year. Geale, a fighter known for his ability to use lateral movement and throw his punches at a high volume was unable to nullify Golovkin’s pressure. Geale’s best moment of the fight came just prior to being knocked out by Golovkin when he was able to land a flush right hand on the champion’s face, before Golovkin’s own right hand landed on Geale sending him down to the canvas and subsequently ending the fight. The question in this fight in my eyes will be whether or not Monroe can establish himself as an elusive target and be able to avoid Golovkin’s pressure and power punches for a full twelve rounds. The statistics are not in Monroe’s favor as Golovkin has scored knockouts of twenty-nine of his thirty-two opponents registering a career knockout percentage of nearly 91%. Although the odds and statistics would seem to favor the champion in this fight, it will be interesting to see if Golovkin looks for a knockout early in this fight, having knocked out his last nineteen opponents. If however, Golovkin is looking past Monroe toward the lucrative fights that may await him should he win this fight, the stage may be set for an upset. As thirteen previous challengers to Golovkin’s crown have found out however, defeating a fighter with a seek and destroy mentality has thus far been a task that has been easier said than done. Whether Willie Monroe Jr. can provide a significant test for Gennady Golovkin remains to be seen. What is also at stake for the champion beyond the potential big money fights against Alvarez or Cotto is also the potential of Golovkin eventually challenging the all-time record for successful Middleweight title defenses, which was set by Bernard Hopkins who defended his Middleweight world championship twenty times from 1995-2005. Golovkin now prepares for title defense number fourteen and if successful, he would tie Carlos Monzon’s mark of fourteen successful defenses.